Looking for the perfect holiday home to rent in Turkey? Panoramic Villa Rentals offers a fabulous selection of holiday villas and apartments to rent in Yalikavak Holiday Gardens, Yalikavak, one of the Turkey's most attractive and appealing holiday destinations. 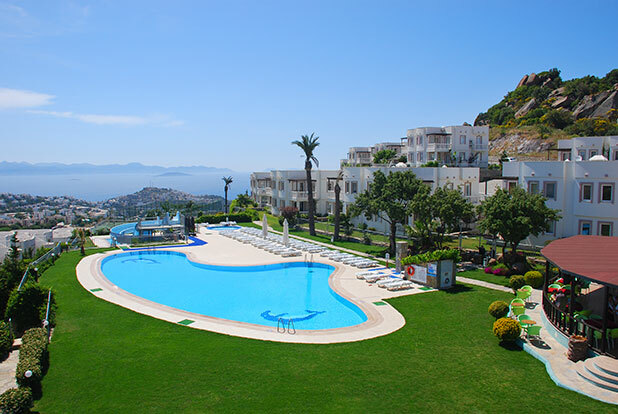 Yalikavak Holiday Gardens Resort is a fantastic hillside development of stunning holiday villas and apartments set in wonderfully landscaped grounds with colourful displays of flowers. 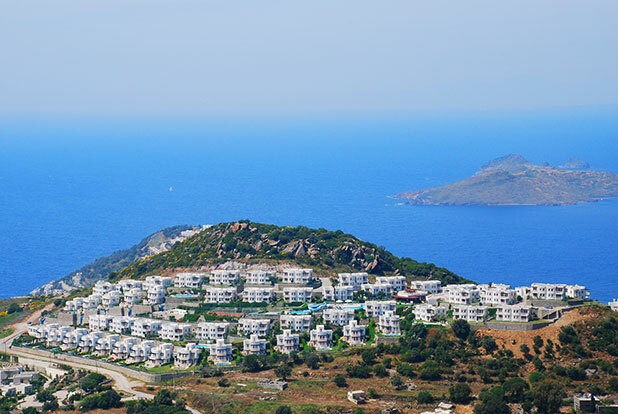 The gated resort boasts outstanding panoramic views of the surrounding mountains and the glistening Aegean Sea. The resort has a fantastic range of facilities available throughout the year, including access to 10 outdoor pools and an air-conditioned indoor pool, as well as a restaurant, bar, a mini waterpark and a gym. We have a fabulous selection of holiday villas and apartments in Yalikavak Holiday Gardens. Each one is situated in a great location, within easy reach of the complex's own extensive range of facilities and supermarket. All of our Yalikavak Holiday Gardens villas and apartments have access to an indoor pool and ten outdoor pools and roof-terrace pools where you can relax and unwind. We offer a variety of holiday villas and apartments in Yalikavak Holiday Gardens for families or groups of friends, from modern and spacious 1 and 2 bedroom apartments, right up to luxury 6 bedroom villas for larger groups. This 2 bedroom ground floor apartment is situated on the prestigious Yalikavak Holiday Gardens Resort a short Dolmus ride from the town of Yalikavak and the small fishing village of Gumusluk. 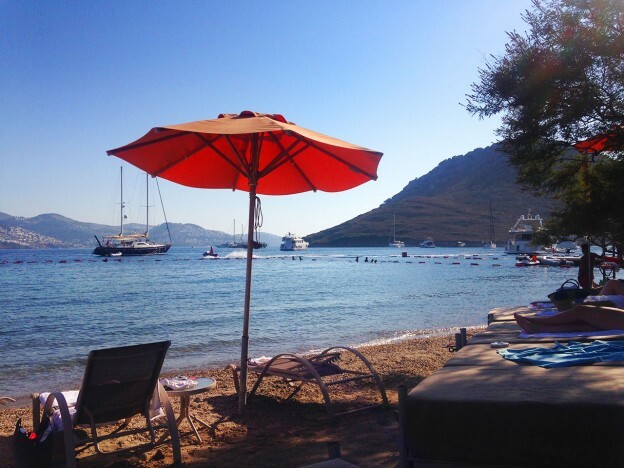 With views over the Aegean coastline this is the perfect holiday spot. A 2 bedroom, ground floor apartment with air conditioning. The apartment has a balcony, roof top terrace and private garden. It is also very close to one of the 10 communal pools on the resort. 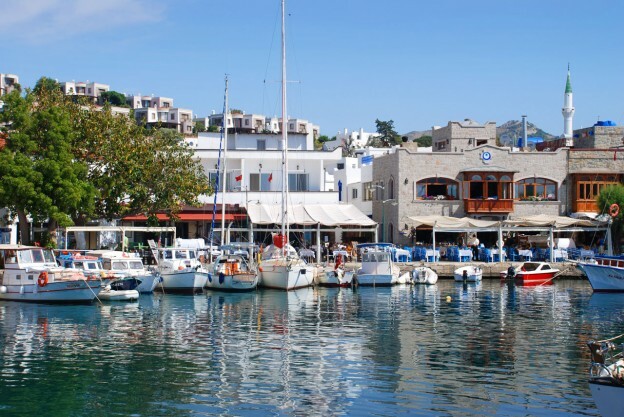 Yalikavak has a great choice of restaurants, shops and bars. Charming 2 bedroom first floor apartment with balcony located on the Yalikavak Holiday Gardens resort near to Yalikavak, Easy access to the nearby communal pool with private garden. Internet available. Fully equipped kitchen & open plan living area. The Yalikavak Holiday Gardens Resort is a fantastic hillside development of stunning villas and apartments set within wonderfully landscaped grounds with colourful display of flowers. The gated resort boasts outstanding panoramic views of mountains and the glistening Aegean Sea, the views are truly breathtaking! The resort has a fantastic range of facilities available to guests throughout their stay including 10 communal pools, 1 indoor air conditioned pool, WiFi internet, restaurant and bar, mini water park, gym and much more. Depending on the size of your party there is a varied selection of rentals on this resort which can accommodate even the largest family or group of friends. *PLEASE NOTE: WiFi signal quality varies on the resort and it is often necessary to move from your property to the main communal pool to secure the best reception. WiFi signal strength is beyond our control. The restaurant caters for all needs ranging from breakfast, lunch, evening meal and snacks. The bar area offers seating around the shaded veranda and terraces which provide an ideal place to watch over the children in the large communal pool during the day or to watch the stunning sunsets over the Aegean Sea in the evening. The Hill restaurant and bar are open from 09:00 until 22:00. The on site shop provides your with basic requirements, this is located next to the Restaurant. A large supermarket is situated just one Kilometre from the resort. This provides everything you would require for a self catering stay (please see the attached photographs). There are more large well stocked supermarkets on the way into Yalikavak, both on the new marina as well as in Yalikavak itself. Extra sunbathing space is available on the pool roof terrace and proves to be popular spot for those seeking some peace and quiet. All communal pools will be open 08:00 until 22:00. A Dolmus (local shuttle bus service) runs from Yalikavak to the resort and back again on a regular basis. This enables those who do not want to drive or hire a car to access all the activities and amenties that the area has to offer. 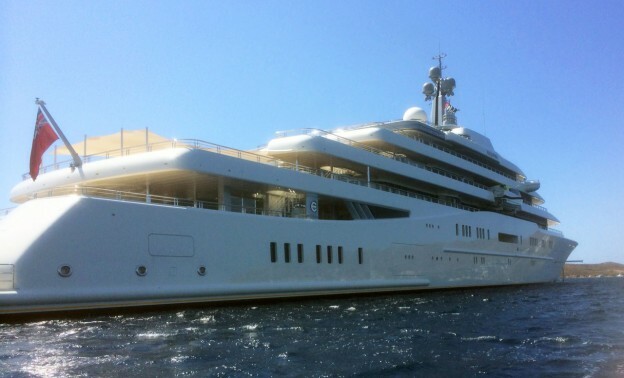 The Yalikavak Dolmus is now running from Yalikavak Holiday Gardens Resort to Yalikavak. The dolmus comes into the site and stops at various points. The Dolmus run at 45 minutes to the hour from Yalikavak Holiday Gardens into Yalikavak, starting at 08:45. They run back to the resort from Yalikavak at half past the hour, the last one being at 00:30. These times may vary outside of peak season and is subject to change. The shuttle bus Peak Season timetable changes around Mid September where trips to the local towns take place every two hours and pick ups from the resort ends around 8p.m. although the shuttle continues to bring guests back to the resort up until around midnight so you can still get into Yalikavak and Gumusluk to visit your favourite shops, bars and restaurants without having to hire a car. You can book various excursions, boat trips, car hire etc at the Yalikavak Holiday Gardens Resort reception. Turkey is outside the EU community and does not have the Euro, so a great place to visit at the moment and is on average 33% cheaper for everyday living, food, drink & entertainment. Those of you who are looking for a late getaway to the Yalikavak Holiday Gardens resort will be pleased to hear that the main communal pool and gym stays open until the 31st of October whilst the smaller communal pools close at the slightly earlier date of the 15th of October. The Shuttle (Dolmus) still runs to the resort and back into town but on a further reduced timetable. 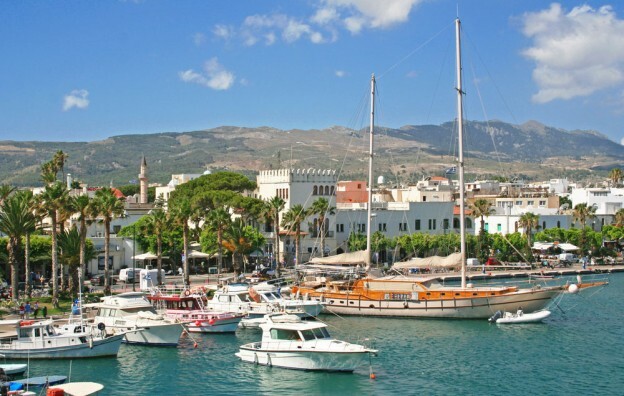 Mugla Buyuksehir Beledeyesi have now started council-run bus services to and from Bodrum.